Take Me To Sank Roo Doe Noo! 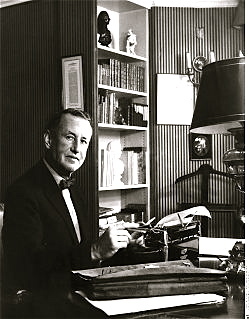 Harry's Bar, Paris, the legendary haunt of Hemingway, F. Scott Fitzgerald, George Gershwin, Marlene Dietrich, Jean-Paul Sartre, Coco Chanel and Noel Coward is one hundred years old today. Many Happy Returns! Harry's New York Bar opened on November 24th 1911 at no. 5, Rue Daunou; and the decor has changed little since that day: it's currently lined with manly dark wooden panelling, painted shields displaying the coats of arms of famous English public schools, and American Ivy League pennants; all under a nicotine-stained embossed ceiling. It's still worth a visit if you happen to be in Paris, even if the style-gurus of the previous century have been replaced with American tourists. Smoking, alas, is no longer allowed in Paris, and that particular 20th century ambiance has vanished presumably forever; however Harry's still serves its famous Bloody Marys- which is especially apt, as the cocktail was invented there in 1920 by Ferdinand Petiot, a barman from Ohio. Put some ice into a cocktail shaker. Pour in a decent slug of Stolichnaya vodka, and top the shaker up with a good quality tomato juice. Add a dash of Tio Pepe or otherwise dry sherry, a squeeze of lemon or lime juice, a pinch of cayenne pepper, celery salt, a few shakes of my favourite Tabasco and Lea & Perrin's Worcestershire Sauce. Do the Hokey Cokey and shake it all about. Strain it off into a glass and add, if you must, a stick of celery. You'll find that the lemon juice smooths it out, and the sherry gives it an added kick. Remember, as with so many other things in life, keep it simple, don't try and doll it up with extra ingredients (I'm not convinced by the addition of creamed horseradish, or chunky black pepper, although steeping a peeled horseradish root in your bottle of vodka, or subsituting Tabasco with a Horseradish flavoured Hot Pepper Sauce sounds like a good idea) and stay away from the gimmicks. I don't like lumps of ice floating around in my Bloody Mary, and think it's much better if strained off. The cocktail's at its best if served very cold, so keep the vodka buried away in the 'fridge, as the Russians do. You'll find the vodka goes thick- and that, if I may make so bold Master Copperfield, is the way to keep vodka if you're going to drink it neat as an accompaniment to blinis and caviar. "You're the Top! You're a Waldorf Salad!" Hands up who doesn't love a Waldorf Salad? Named after the Waldorf Hotel in New York, it's supposed to have been invented in the 1890's. By the maitre d'hotel, Oscar Tschirky- who also laid claim to that tantalising breakfast dish, Eggs Benedict. The original Waldorf Hotel was on the site of what is now the Empire State Building, and demolished in 1929. Anyway, it's a simple old thing, and easily made from a combination of sliced celery, diced apples (I leave the skin on), walnuts, and raisins. You bind the salad with mayonnaise (or just possibly a simple dressing) and serve it on a bed of peppery lettuce leaves, as the whim takes you. Nothing more, nothing less. I'm sitting here after a pretty stressful week (we're moving house) and sipping an almost perfect Bloody Mary cocktail. It's almost perfect, but it's not cold enough and it's crying out for a dash of dry sherry. I've always thought that the three most famous cocktails in the world are (in no particular order), the Dry Martini, the Margarita, and the Bloody Mary. I've tried making Bloody Marys in various ways, but time after time, I return to The Greasy Spoon's own recipe, which, as I'm a kind sort of chap, I'm about to share with you. First, you put some ice into a cocktail shaker. Next, pour in a decent slug of Stolichnaya vodka, and top up with a good quality tomato juice. Add a dash of Tio Pepe, a squeeze of lemon or lime juice, a pinch of cayenne pepper, celery salt, a few shakes of my favourite Tabasco and Lea & Perrin's Worcestershire Sauce. I don't like lumps of ice floating around in my Bloody Mary, and think it's much better if strained off. But the drink's at its best if served very cold, so keep the vodka buried away in the 'fridge, as the Russians do. You'll find the vodka goes thick- and that's the way to keep it if you're going to drink it neat, as an accompaniment to blinis and caviar. You may be surprised that I am devoting a whole post to scrambled eggs. What's there to know about them, I hear you ask? Well, quite a bit. For seven long and hard years, I had to endure the scrambled eggs made by the gastronauts who ran my school kitchen at Dotheboy's Hall. Watery, and rubbery, like some experimental industrial plastic; I reckon that they had added quite a bit of egg powder and water to the mix. But scrambled eggs made properly is an entirely different matter. Here's how that great French chef, Auguste Escoffier, made them: Break eight good eggs (yup, eight eggs) into a mixing bowl. Blend them very very gently with a fork. You do not want to beat them. You do not add water or milk. That's what British cooks did in the 1950's. You don't want to add salt at this stage, either, as it makes the eggs watery, and the finished product will end up less yellow. I think it was the restauranteur, Marcel Boulestin, who suggested that Escoffier also rubbed garlic onto his fork to add a bit of flavour to the eggs. I'll have to check up on that one- I may be wrong. Anyway, now heat a small copper pan. When the pan is hot, add a knob of unsalted butter. Pour in the eggs, and start to cook them on an extremely low heat. In professional kitchens, they would probably use a bain-marie. That means placing the smaller pan over a larger pan full of simmering boiling water to get the lowest heat. As I've got a job of sorts to hold down, and have limited time, I don't do this; but I can only stress that for it to work, you need to set your heat to the lowest possible settings. Stir slowly with a wooden spoon from the middle, so that the egg sets in creamy curds. It's a real art. You don't want the egg to stick to the pan, yet at the same time, you want the egg to set. When the eggs are almost ready, stir in some cream. Quickly remove the eggs from the heat. They will carry on cooking in the pan. Now you can stir in some more butter to taste, and season with salt, pepper, and some chives. As Ian Fleming once wrote: "Scrambled Eggs, Bacon, and Strong Black Coffee- they never let you down." Though I suppose at the same time, he was implying that his women did. Enough said. I love Black Pudding. There will be unfortunate finickity and squeamish individuals out there who will take one look at this post, and want to run for the hills, so my mission this sunny October morning is to try and convert them to the cause. It's like that Scottish favourite, Haggis, which tastes a bit like a spicy American meatloaf. Yes, the preparation sounds, and probably is gothic; but the taste and result is something to be recommended. 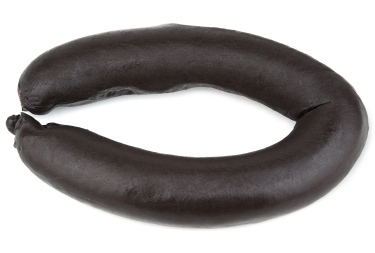 So, let's get the gothic part out of the way: how is Black Pudding made? What exactly is Black Pudding? It's a sausage made from the blood of a pig. The blood is then cooked with a variety of ingredients, which could include goodies such as suet, oatmeal, milk, onions, breadcrumbs, cayenne pepper, and nutmeg. Cooking the blood in these ingredients will make the blood congeal, and hey presto! You have a black pudding; or blood pudding in America, blutwurst in Germany, boudin noir in France, and white pudding in Ireland. You eat it for breakfast. I cook mine very gently in a knob of butter for a few minutes on each side. In Britain, Black Pudding tends to be a local speciality of the northern counties such as Lancashire, but in fact, similar puddings are found all over the world. I'm going to take this opportunity to have a little rant about the reputation and state of British Food. Okay, we now have some top-notch (and fiendishly expensive) restaurants in London; and generally, the standard of food in Britain is better than it was in the post-war period of rationing, spam fritters, and dried eggs. But the tradition of cooking food at home, especially the local culture, has been lost. Many of the old-fashioned British classics, are similar- if not identical- to dishes you can find in the French Countryside. 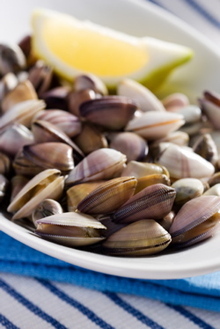 They make Moules Mariniere, we have Devon Mussels in Cider. They make Boudin Noir, we have Lancashire Black Pudding, they make Boeuf Bourginon, we have Beef in Guinness with Dumplings. The difference is that your typical French grandmother will have a whole list of local specialities up her sleeve- and she will know how to prepare them with love and attention. In Britain, granny is far more likely to be found slumped in front of East Enders eating Sainsbury's Chicken Tikka Masala Surprise straight from the packet. Look at our food shops. In France, you will find endless small corner shops selling wonderful selections of beautifully presented ingredients. 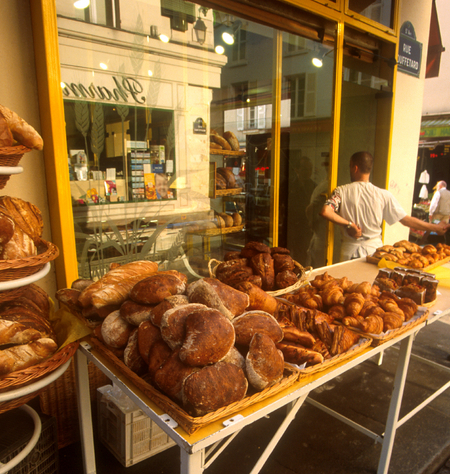 Like this boulangerie in Paris, pictured above. In Britain, we have er- the supermarket (with, in my opinion, pretty dire stocking policies), and miserable corner shops selling dusty tins of this and that at inflated prices. And look at the generous selection of foods you can find in New York delis! Fantastic! Rant over. 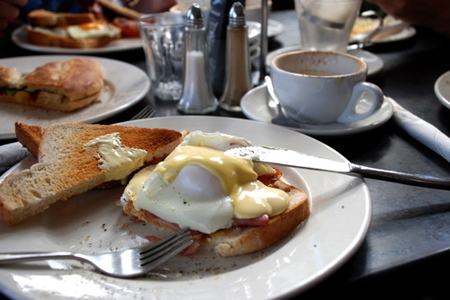 I think my favourite American dish has to be Eggs Benedict. There's just something about its simplicity: the runny poached eggs, the buttery Hollandaise sauce, and the crisp bacon or ham contrasting with the soft English muffins. There are various theories as to how it was invented; one being that the legendary Oscar Tschirky (of Waldorf Salad fame) put it on his hotel breakfast menu after Lemuel Benedict, a retired Wall Street stockbroker, came up with the idea as a cure for his hangover in 1894. This may or may not be the case. Melt 8oz (225g) of butter in a pan. Meanwhile liquidise two egg yolks, the juice of one lemon, and freshly ground black pepper. When the butter is hot, turn the liquidiser onto full, and slowly pour in the butter. Next, poach some large eggs in salted water. Toast the English Muffins, and spread them with butter. Put some slices of ham, or Canadian Bacon on top of the muffins, and top with the poached egg. Pour over the Hollandaise sauce and serve immediately. For years, I've always assumed that Mott's Clamato was Canadian. Well, I was wrong. It's not. It's American. The drink was invented in 1966 by the Duffy-Mott company of New York. If you don't know it (and there may be many in Britain who don't), it's a blend of tomato juice and clam juice, with a few extra spices thrown in. 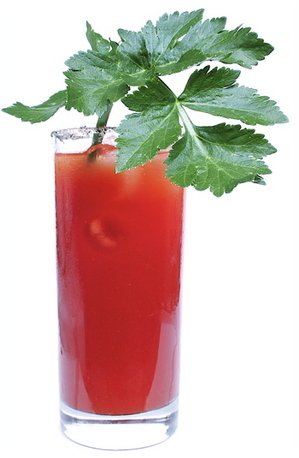 The Canadian connexion comes from the Bloody Caesar, Canada's favourite cocktail. In 1969, Walter Chell was challenged to create a new cocktail to celebrate the opening of a new restaurant, Marco's, in Calgary. He came up with a variation on the Bloody Mary but decided to add clam juice to the tomato juice instead. Today, Mott's Clamato is owned by Cadbury-Schweppes and is popular throughout North and South America. It's estimated that approximately 70% of Clamato sold in the United States is bought by Hispanics. The Mexicans mix it with Budweiser beer to make the Chavela cocktail. I think I'll stick with the Ceasar for the time being. For some reason, the Bloody Mary cocktail always makes me think of Connecticut gymkhanas, tailgate picnics, Mock Tudor woodies, and hearty Nantucket sailing types; especially if served from the old family tartan thermos flask. There's a theory that the Bloody Mary was invented in 1921 by Fernand "Pete" Petiot, the barman at Harry's Bar in Paris (Sank Roo Doe Noo), which was a hang-out for American ex-pats such as Ernest Hemingway and F. Scott Fitzgerald. I'm glad to report that I've sunk a great many Bloody Marys in my time, but so far, not that many have lived up to scratch. After years of experimentation, I've finally cracked the secret, and you're in luck, because, against my better judgement, I'm about to reveal all. Crush some ice and drop it into a cocktail shaker. Pour in some good tomato juice, vodka (I prefer Stolichnaya), a few drops of Lea & Perrins, a few drops of Tabasco, a modest sprinkling of celery salt, and some cayenne pepper. And now for a tip that sorts the men from the boys: add a generous dash of dry sherry (Tio Pepe is ideal), and a squeeze of lemon or lime juice. I picked up this idea from the excellent Grenadier Pub in Wilton Row, packed on a raw Sunday morning with high-budget American tourists, and braying Guards Officers. It's supposed to be a secret, but I looked over the pewter bar counter and saw what they were up to when the bar-girl wasn't looking. Shake it all around. Strain it into a chilled highball glass. That's it. If you really must, you can add a stick of celery as a garnish. Some people add horseradish, but I'm not that keen, because it curdles, and your cocktail ends up looking a mess. I've also had one recently at a gastro-pub down in Dorset, which had large chunks of black pepper floating around in it, and that wasn't that great either- unless you're addicted to raw pepper. 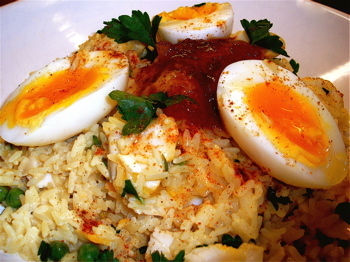 I've had arguments with a friend of mine about what makes up a proper kedgeree. A breakfast relic of the British Raj, in its purest form it's essentially rice, smoked fish and eggs (the original dish, khichdi, included lentils); and Great Aunt Agatha, in a naughtier moment, might have stirred in a smidgin or two of curry powder. Here's my improved creamier version. And there's wild rice for extra crunch, too. First, cook a cup or two of wild rice for about 25 minutes. Next, fry some chopped onions in oil and butter. Next stir in some rice. (I prefer Uncle Ben's Long Grain- which has had the starch removed, and will stop the kedgeree becoming one big mess). Add a few teaspoons of curry paste and some grated nutmeg, and then add the partially cooked wild rice. Cook for a few minutes, so that the rice becomes translucent and soaks up the spices. Meanwhile, cook some smoked haddock fillets (preferably undyed) in a mixture of milk and water, with a few peppercorns and a bay leaf. Bring to a simmer, and then turn off the heat, and let the fish sit in the hot milk and water (with a lid on) until cooked. This is the best way to poach smoked haddock. Set the cooked fish aside, and tip the resulting milky fish stock over the rice. Simmer this on a low heat until the rice is cooked. In effect, you are making a pilaf. You may need to add some more water and stock. When the liquid has been absorbed, flake up the haddock into large pieces and fold into the mixture with a dollop of single cream, a few knobs of butter and a good squeeze of lemon juice. Slice up some softly boiled eggs, and serve with chopped flat leaf parsley, and a pinch or so of Cayenne Pepper. For some reason, this dish works well with Mango Chutney.